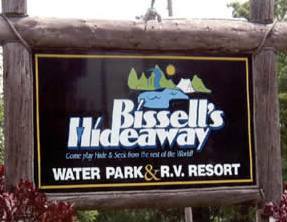 Bissell’s Hideaway is a large camp site perfect for any type of guest. This camp site offers excitement for all of its guests at the enormous one acre swimming pool, giant waterslide, and kiddie splas area. With other activities like mini golf, bingo, volleyball and horseshoes, there is endless excitement at Bissell’s Hideaway. This amazing campground has recieved the highest rating by Woodall with 5W’s in recreation and 5W’s in facility making it Niagara’s top all-inclusive resort. Bissell’s is the ultimate resort in Niagara for camping, and is only located a short drive away from all the casinos, golf, wineries, theatres, attractions and the Falls themselves! The season starts on May 1st and ends on October 15th, for this extraordinary campground in the Niagara Region, Ontario. With 350 sites and an abundance of amenities for all the guests of the camp site, this is Niagara’s top campground. Located along the wonderful Niagara Escarpment, this campground uses the beauty of the landscape to provide guests with a one of a kind Niagara Falls Getaway. Bissell’s Hideaway was the proud recipient of 5W’s in recreation and 5W’s in facility by Woodall. The main attractions at this outstanding campground is the massive one acre pool and two giant waterslides on the resort (30 & 40 feet high). Also available for all guests are paddle boats, mini golf, bingo, baseball, a snack bar, laundromat, and arcade. All of this provides guests with the best and most unique experience for their next Niagara Getaway.